WBO ORIENTAL OFF TO ROARING START! The WBO Oriental is a KNOCK-OUT success! Recently, last December 15, 2007 in Auckland, New Zealand, promoter Box-Out Promotions and matchmaker John Glozier stirred-up a cooker, as hot Super Middleweight champion Daniel Mckinnon scored a dramatic 3rd round knock-out against highly regarded Australian undefeated prospect Kerry Palmer to win the vacant WBO Oriental Super-Middleweight title. In an long distance call from New Zealand, Hawaiian Fil / Am WBO Executive Asia Pacific Vice President Leon Panoncillo who supervised the Oriental championship fight, informed Philboxing.com that he has successfully launched the WBO Oriental title, a newly branch regional body of the WBO Asia Pacific that was developed during their 20th WBO Anniversary Convention. Panoncillo's rationale in offering the Oriental title is opening the doors to other promoters in Asia with the regional title. "Tthey too will get an opportunity at our World Boxing Organization title. Its all about opening our arms to the Orient, especially everyone is after the sleeping giant China." "Next year I have a mission to accomplish and that mission is to have every promoter in China and other Asian countries promoting our WBO regional titles, eventually there will be more WBO World Champions in the Orient," explained Panoncillo. "I believe that with our Integrity, Democracy and Honesty the WBO will be the most prestigious world boxing body in the world, that includes the Oriental countries. I am very delighted to continue on the hard work of providing opportunities for the boxers." 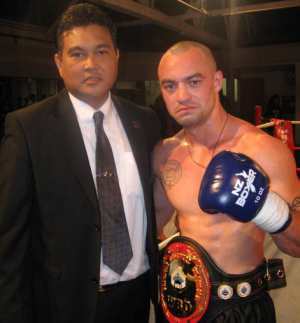 WBO Asia Pacific Chairman Leon Panoncillo poses with newly-crowned WBO Oriental super middleweight champion Daniel McKinnon in New Zealand. Top photo, from left: Palmer, Panoncillo and McKinnon. Meanwhile, Panoncillo has scheduled one more WBO Oriental to close out an impressive Year in the Asia Pacific rim as Temuzin Rambing Promotions of Indonesia has scheduled long-time PABA Super Featherweight champion Roy Mukhilis and young Filipino prospect Fernando Otic of SGG Promotions, for the vacant super featherweight Oriental title. Rambing met Panoncillo during the WBC convention in Manila to solidify this arrangement for his WBO Oriental program. Panoncillo added: "In the past Rambing had ask me about the WBO regional vacancy's and I couldn't provide him any because in his fighters weight division, all was occupied and promoted by various promoters in Asia, especially Philippines and Thailand". "However, when I mentioned our newly developed Oriental regional, he immediately jumped on the opportunity to schedule this championship for his fighter. This shows how credible the WBO is in Asia". Panoncillo explained, he also scheduled several WBO Asia Pacific and YOUTH championship bout lined up in the beginning of the year, however, adding to the Asia Pacific titles, there will now be two vacant Oriental titles up for grabs, the Jr. welterweight and featherweight titles lined-up on January 11th in Indonesia, Jr. featherweight scheduled January 24th in Philippines, and most interestingly a WBO Oriental cruiser-weight title in the country of Samoa on January 27th. "The new year is definitely going to start off with a Big Bang," Panoncillo added. In closing Panoncillo wanted to thank all Asia WBO Promoters, Managers and fighters for their great support of the World Boxing Organization. "I wish you all the Happiest Holidays and have a Happy and Safe New Year!"